Disclosure: I am an influencer with Grove Collaborative. At no extra cost to you, I may be compensated for sales made via my referral links; thanks for your support of my blog. The bathroom may not be the most fun place to clean, but a fresh bathroom is essential to a stress-free day. Fortunately, the right products and tools can make bathroom cleaning so much easier. 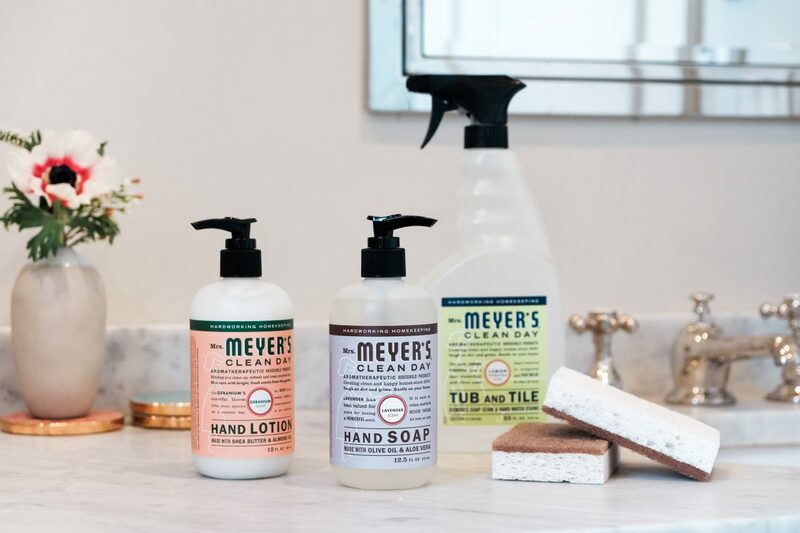 If you’re an existing customer, you’ll receive a Mrs. Meyer’s hand soap for free. I consider a nice hand soap a “must” for a clean bathroom, and Mrs. Meyer’s soaps are my favorite. We keep a variety of scents in our house; Bluebell is our current favorite. Of course, the one bathroom cleaning product I can’t live without is Mrs. Meyer’s tub & tile cleaner. I used to hate cleaning our tub and shower because the fumes from traditional cleaners always gave me a headache. At the same time, I’m not a fan of scrubbing, so I need a cleaner that really works. Mrs. Meyer’s tub & tile checks all the boxes! It works so well on hard water buildup, plus it smells amazing. Paired with effective natural cleaners, the right tools are a game changer for your bathroom cleaning. I never thought of sponges as a bathroom cleaning necessity until I started using these Grove Collaborative walnut scrubber sponges. The scouring side is made from crushed walnuts and is great for cleaning grout, while the soft side is perfect for wiping down sinks and shower glass. I always keep a couple of these in my cleaning kit. While I’m cleaning the bathroom, I like to do a quick check and stock up on essentials like toothpaste, deodorant, and toilet paper. Since I’ve started using Grove Collaborative, I can simply add those items to my next shipment and they arrive at my door, on my schedule. So easy! Grove has saved me countless trips to the drugstore for an overpriced roll of recycled paper towels. Plus, my Grove VIP membership helps me save even more with free shipping, free gifts, price matching, exclusive sales, and personal service. When you use my link to get your Bathroom Basics Kit and submit your first order, you’ll be signed up for the free 60 day VIP trial. This offer truly makes bathroom cleaning so much easier, so don’t miss out. The offer ends Sunday, April 9 at 6 p.m. PST, and supplies are limited. Sign up for Grove Collaborative HERE. You will receive the Mrs. Meyers Bathroom Basics Kit for free when you sign up! Comment below to tell me your favorite Mrs. Meyers scent and share one bathroom cleaning tip that makes life easier.